Friday, December 8th & Saturday, December 9th at 7:00 PM - Jazz Nutcracker event. 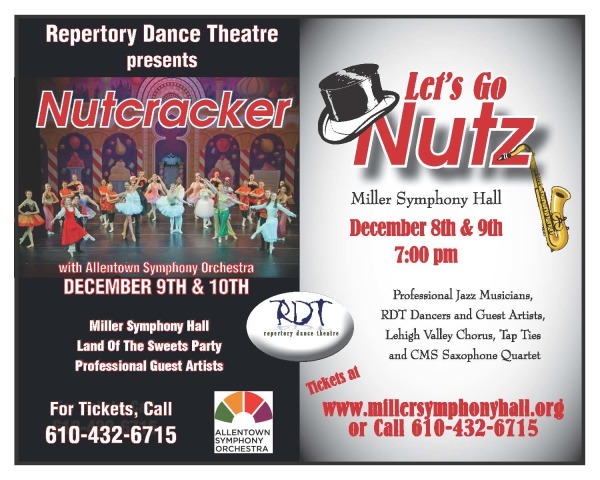 Let's go Nutz features the area's finest jazz musicians accompanying RDT dancers and guest artists to selections from the Glenn Miller jazz version of Nutcracker. Special performances by Tap Ties and Lehigh Valley Chorus. Cash bar. Doors open at 6:30 PM.